The autumn colored trees show their reflections in a pond along the Sand River in Lake Superior Provincial Park in Ontario, Canada as colorful leaves rest peacefully on the rocks. 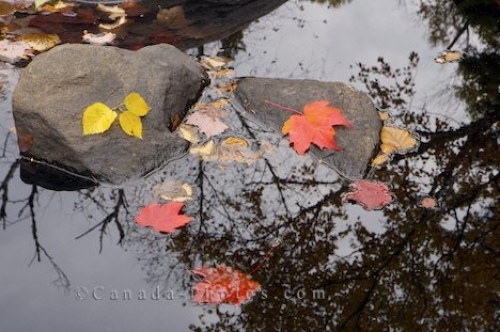 The leaves drop from the autumn colored trees above a pond beside the Sand River in Lake Superior Provincial Park in Ontario, Canada landing on top of rocks, in the water and along the banks. The trees which tower above, show their reflections in the stillness of the pond which are continuously changing appearance during autumn. Along the Pinguisibi Trail in Lake Superior Provincial Park, the Sand River rushes by where beautiful waterfalls decorate the landscape, creating small, quiet ponds along its way. Reflections in a pond beside the Sand River, Pinguisibi Trail, Lake Superior, Lake Superior Provincial Park, Great Lakes, Ontario, Canada. Picture of the Autumn leaves and their reflections in a pond in Lake Superior Provincial Park in Ontario, Canada.